One of the moms shared with me a recording of a conversation she had with her 7 year-old son. You can hear the regression to baby sound when he talks about his first parents. Zilla, we know from your | previous | questions that you are devoted to bringing openness (defined as dealing with What Is) to adoptive parents in your part of the world. Having lived near there once upon a time, I suspect that you may face even more mindset barriers than we do in this neck of the woods. To explore the questions you ask about therapy for the adopted child, I turn to my writing coach and adoptee-whisperer Anne Heffron. Anne is an adoptee-in-healing and a storytelling doula. We are fortunate to have her always-enlightening take on matters of adoption. On matter of humanity, really. If a child were in a fire, no matter how much the parents loved that child or knew how to bathe wounds, the child would still need to go to the doctor because such deep burns require care from someone trained in that particular kind of trauma. The same is true, I believe, about kids who were relinquished by their birth parents. No matter how much the new parents talk about the situation or love the child, the fact is that child’s brain was affected by the parental loss in ways the new parents most likely don’t know enough about to deal with as efficiently and as effectively as possible. Why treat burns with band-aids when you can get the real deal by going for professional help? Why risk additional trauma? An adopted child has special needs that a parent — one who has not been adopted him or herself and who has not had years of training about how early separation from the mother affects the child’s brain — can not meet. No matter how badly the mother wishes she could. It’s not about the parents’ wishes for a happily ever after. It’s about the child’s needs to heal all that came before and since. As we know, this is an ongoing effort, not a one-time patch. Anne Heffron was born in Manhattan in 1964 to a college student. Fifty-one years later Anne returned to Manhattan to find the roots of Her story, now the memoir You Don’t Look Adopted, begins with her birth instead of “The day we got you.” Keep up with her at AnneHeffron.com. Anne addresses the important notion that some wounds need beyond-layman’s expertise for optimal healing. I wish to address one other reason adoptive parents should consider seeking therapy for a child who has experienced trauma and/or loss. Some healing just can’t come from the adoptive mom, no matter how much love and trust there is between her and her child. Some of the complicated feelings of love and rage, of attachment and abandonment, of need and rejection for a birth mother can be aimed at the one who took her place. This means that the one who took her place is not someone who can easily sort out these complex emotions. A guide is necessary, someone who understands this dynamic well and who is emotionally removed from it. Not just any therapist will do. Both Anne and I implore you to find an adoption-competent therapist. My Kid Has No Adoption Issues. That a Problem? 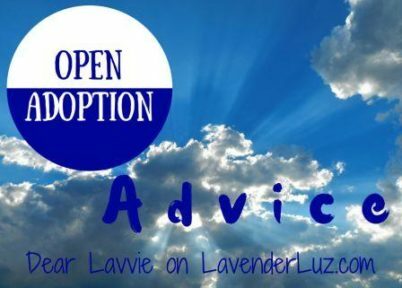 Isn’t it possible that my kid is OK with being adopted? Adoption Therapy: The foreword to a highly acclaimed book (you’ll want to read the whole anthology). Adoption Isn’t a One-Time Event. Agencies are starting to understand that. Two of my favorite women! I love that A) you are both so consistently available to others and B) you are so very careful and loving with your responses and C) you are, imho, right on the money always. This is a really important question and as you say, Lori, probably imbued with some geographical complications. Kudos to Zilla for getting this answer for all the moms reading your blog! Sometimes…if the therapist is an adoptee. 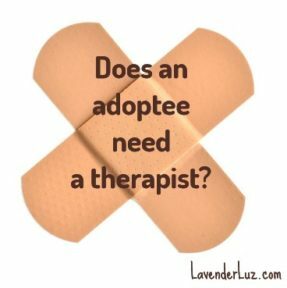 In my unscientific observations, I’ve found that a disproportionate number of adoption-competent therapists are also adoptees, which makes them uniquely qualified to help the rest of us chart that territory. Have you found this to be true also, Sherrie? I think it is important to have therapists that are adoptees or natural mothers who have done their healing work. There are way too many people out there that have not done their own healing while they are counseling others. If the therapist can’t touch their own pain, they have no business helping adoptees. Bravo to Zilla for her continued quest to help adoptees and their parents navigate adoption. Truly commendable to work she is doing. And Bravo to Anne and Lori for their wisdom and insight. Therapy is still often shunned due to stigma but also because often the therapist connected with the patient isn’t the right one. It doesn’t surprise me that the most effective therapists are those who are also adoptees. We see this with other traumas too. That said, I firmly agree with Anne and Lori that it’s important to find a good therapist, even if it means trying out multiple ones to find the right match. When that connection is there, so much healing happens, which is important beyond measure. I love that analogy to the fire — pain and trauma are pain and trauma, and getting professional help makes total sense. I also love what Lori said about how the adoptive mother isn’t necessarily the best person to try to work through these issues — I can imagine boundaries could get blurred and hurts could get flung and a child might not feel totally free to express all the trauma and fears and pain for fear of hurting their adoptive parents. An unbiased third party seems to me the best choice. How wonderful to have such resources for adoptees and adoptive parents! Also, since I’ve been in therapy, I think everyone should see a therapist. When do you think is an appropriate age? I have a four year old, and we have regular face to face contact with her first mom and have since she was born. She is of course aware of her adoption, and we talk about it regularly. She does not seem conflicted or upset by this, but I am not naive enough to think she doesn’t have those feelings or that she most certainly will at some point. When will I know when a good time is to get her to therapy? I’ll see if I can get an actual therapist to respond, Ann, but in the meantime I’ll just say that I think you’ll know. I mean, if/when you observe overly long or deep or frequent periods of sadness or frustration or anger, seemingly unrelated to normal stages and not exactly explainable or solvable, that might be a good time to set up an appointment with an adoption-competent therapist. I would advise you start finding one before then. That’s a big deal in itself! Most people I know have found a good therapist by asking around and finding a good fit. It’s also important to find a therapist who is not all about attachment disorder. As a former adoption social worker and an adoptive mom, and as a therapist who has a specialty in adoption, messenger too many families sent down the rabbit hole for no reason, and destroy any hope for healing and a happy future. My business partner and I train other therapists to correctly identify PTSD and anxiety, as well as possible genetic links to mood disorders and other contributing history prior to using attachment disorder. Love can create nurturing and safety, but trauma needs treatment. Not for forever. To address issues as they arise, at developmental milestones, nd especially for the entire family so the adopted child is not the identified problem.